Self Defense Mastery at Warrior Concepts International | "Which Weapon is Best?" Which Martial Arts Or Self Defense Weapon Is Best? One of the most common questions from beginning students with regards to martial arts or self defense weapons is, "Which one is the best?" And, while this is a good question, it is also limited in scope and vision. This article discusses the concept of the "best" weapon from an objective viewpoint which centers on what's going on, rather than which one you like the best. Everyone seems to have an opinion about why this weapon or that weapon is best, and why. But, if you can step back and recognize where these ideas come from, you'd see very quickly that they really don't answer the question, nor do they make you an more prepared to be able to defend yourself in a real world attack. If you can see that, when the average human being gets into any relationship, he or she tends to heavily favor the "positive" aspects of the "other." It doesn't matter if we're talking about a new friend, lover, business partner, car, or in this case... a self defense weapon. But, on the other extreme, when someone wants out of that relationship, or doesn't want to get into it in the first place, he or she tends to direct their focus on the "negative." They can only see the disadvantages of the relationship because that's what they're looking for. However, to the Enlightened Warrior - to the self defense expert - there is no "best." Everything is equal. And, it's equal because it's not the weapon that is best, when compared to every other weapon, but appropriate for the situation at hand. ...that same weapon also has many disadvantages that, if not recognized, can be exploited and used by your opponent to beat you! Here's an example from an actual question that was posed to me from one of my students. Admittedly, this question is about two weapons that are from different time periods, but it shows the mindset that I'm talking about. "Sensei, I was wondering about which weapon is best. I have training in both the kubotan (yawara), and the kusari-gama ('chain and sickle weapon')." "I don't believe that any one weapon is "better" than any other. Each gives you certain advantages in a fight, but it also has certain disadvantages. For example, the Kubotan is much better at close range than the kusari-gama - and it is legal in most places. "However, traditionally, the kusari-gama gives you the ability to attack your opponent at long range, but requires a very high level of skill to use it properly (at any distance)." "The point here is to try to avoid looking for things - weapons or self defense techniques - that are "best," and instead focus on the advantages and disadvantages of things within the context of different types of fights. For example, neither the kubotan nor the kusari-gamaI> is "best" if we are being attacked by someone with a firearm, bow & arrow, blowgun, rocks and/or bottles, or any other long-range, projectile type weapon." ...has the greatest chance of winning! Effective self defense requires more than just a few "karate moves." It involves the ability to think strategically, and understand how to defend yourself with as little wear-and-tear on you as possible. If you're serious about learning how to defend yourself as quickly and easily as possible - using the self defense mechanisms that are already hardwired into your own body, then check out my very unique, EDR: Non-Martial Arts Defensive Training Program. 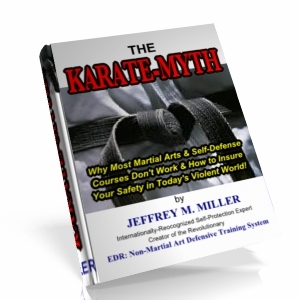 Jeffrey M. Miller is an internationally-known self defense expert. Each month he teaches literally thousands of students through live seminars, corporate training events, and his online self defense courses, the lessons to be able to survive in Today's often dangerous world. ever has a chance to touch you! "Foundations of Self-Defense Mastery Home Study Program"